The cats had our sunroom cushions covered in fur. So, we decided to spray them off. The cushions needed to drip dry, so we put them on the trampoline, and thought nothing more of it. Until Baby Plum and Cheese Puff discovered the new game. They lined them up, and crawled, or jumped across. I'm not sure what Baby Plum is doing, but it is part of the game. He is not napping. Now Cheese Puff is doing it. Maybe they were napping on their trek across the trampoline. I never would have come up with this game. I love how they come up with such fun things by themselves! I think Little Elvis was swinging, reading and eating sunflower seeds about 15 feet away. Right before Mother's Day, Baby Plum's school had a Muffins for Moms event. I took him and Cheese Puff. At first, they seemed happy and had fun. See? They are both eating. Then, they are both smiling. About 2 minutes after this picture, Baby Plum got sad. He cried on his way back to class. Not sure why. He's not a talker, so he wouldn't tell me. He doesn't like to use his words, especially when he's upset. Baby Plum has had about a month where he was more sensitive than usual. He seems to be doing better. Either that, or we've gotten better at figuring out what causes his tears. I have a much harder time tuning out his tears. His brothers cry so much more than he does. They've built up my immunity. Little Elvis got to dress like a rock star for some sort of reward at school. He wanted to rip up his clothes. I said no. I told him I would do him more "emo," because he had clothes that would work. He mainly wanted a Mohawk. That worried me a little more. I debated giving him "tattoos," and a friend talked me into it. So, here are some "rockin' Rock Star photos!" I wrote Rock Star on his knuckles. He wore blackwashed jeans, a striped V-neck t-shirt, a belt, and his Chuck Taylors. Since Little Elvis was posing, his brothers needed to as well. Here are my other rock stars. So, I forgot to rotate this. He also added sunglasses to his ensemble. Like the Mohawk? We tried a couple of different ways. The first efforts did not really work. I used LOTS of hair gel, though. So, when I tried my last idea, it really held... at least while he was at home. How is that for a Mohawk? A ton of gel, and lots of ratting. He was thrilled with his rock star look! And then went right back to athletic shirts, pulled up red socks, running shoes, and t-shirts. Oh well. Our town has a big art fair and race every May. It's a big deal around here. They get artists in from all over to sell their wares, and most of the kids in the district participate in a writing contest. Little Elvis won for 3rd grade poetry this year. They have an awards ceremony. And this year, before the ceremony, there was a Jazzercise demonstration. Only one person was dancing. It wasn't hard to talk our boys into participating. Cheese Puff had run to get Gram and Coachpa, so at first just Little Elvis and Baby Plum danced. They may not be the best dancers, but they are happy to get into it. And Cheese Puff was thrilled to join when he got back. So... to deviate a little bit. We ran into a friend at the grocery store right after the awards ceremony. She saw video of the boys Jazzercising on Facebook. It hadn't been 30 minutes. I talked to someone about a week later, and she had seen it, too! I had no clue it would be posted. I don't think they put their names up, because they didn't know them. Little Elvis was so excited to get up and get his award! He got $10, and a ribbon. He drew a picture at the bottom of his poem, and asked me to frame it with his ribbon. It's now ready to hang up. We put the newspaper clipping in a smaller frame, and called the mayor's office. It was a bad week to call, because he's got big plans this weekend. Hopefully, when he gets back, Little Elvis can present him with his Ode to his hometown. Bob here, Meredith's husband, making another cameo appearance. Baby Plum graduated on Friday from kindergarten. The theme of the program was, "When I Grow Up," and each child was given the chance to tell the audience his/her career goal. First of all, let me tell you all how proud I am of Baby Plum's kindergarten year. He had the same teacher, Ms. Haley, that Little Elvis had when he went through kindergarten. She was a rookie teacher when Little Elvis was in her class, but even then we knew there was something special with the way she was able to connect to little ones. Now seasoned with three years of teaching, she has been an even better teacher for Baby Plum. He has really blossomed as a reader and continues to be the sweet little boy he has always been. On his 4th marking period report card, he didn't just get all A's (he's done that all year), he got 100% across the board. If you missed it, he says that he wants to be a weatherman. As father and former weatherman, I had to fight back tears at the moment. He is such a sweet boy and wants to do so many things that I do. He loves music, he loves maps. He and I are going to get the chance to make music together this summer -- I'll be accompanying him as he sings "The 50 States That Rhyme" as part of theater camp. The boys possibly have a long summer ahead of them. At times, they are so sweet, and play together so well... Then, the fighting starts. Little Elvis and Cheese Puff are so alike, or maybe not enough alike. All I know is that when one gets all tooncey, the other is very happy to pick and pick until the other lashes out. Then there's Baby Plum. He takes a lot of stuff. But even he hits his limit. And then he starts hitting, or crying, or both. I'm a little nervous. Just the past few afternoons when they've gotten home from school, they've been alternately pretty sweet, and extremely sour. A few weeks ago my uncle gave each boy a set of deer antlers. Did I ask for the antlers? No. Did my children? Yes. Cheese Puff and Baby Plum each got a set of three deer antlers that were mounted on a piece of wood. Six antlers in all! Little Elvis got a deer skull with antlers. I believe it's called a European mount. I told my uncle that if he gave my kids those antlers, they would be painted. He said he didn't care. I primed the European mount, and then painted it super-shiny silver. At first Little Elvis was mad at me, but they he decided that it looked like a ghost. He calls this this Ghost Deer, and it's the mascot for his basketball team -- The Ghost Deer. He's drawn up a logo. He has written a fight song. He goes through the motions of the entrance whenever he plays basketball. Here's a side view of the Ghost Deer. The chair? His class painted it as an art project. Somehow we won the auction of it. I think it's cute, and he painted something on it, although he doesn't remember which part. Ghost Deer's main goal is to hold baseball hats and maybe a hoodie. Although I hate to cover it up. It turned out very cool. Bob put a wedge of wood behind it, and we screwed it directly into the cabinet. My dad gave Baby Plum these horns. (I'm not ready to do the sets of three yet.) Baby Plum had several color options, but he wanted black. These have a slight copper sheen to them. Baby Plum loves them. They also hold baseball hats. On Friday my parents took the boys to a place they found online called the Rattlesnake Saloon. Here they are posing at the saloon. Little Elvis is big into crossing his arms, and I guess Cheese Puff's copying him. Yet again, he's copying him. Two of the boys have big smiles in this one. I think Cheese Puff is showing them a rattlesnake in this picture. Obviously, none of them are scared. Little Elvis is not a big boy, but he can put away food that he likes. He ate almost a whole half pound burger apparently. Rattlesnake hunting must have made him hungry. Baby Plum is such a funny little guy. The other day he wrote "Maybe" on a sheet of paper, and then used that as his answer for any question. I took the picture with my phone. Should have used the camera. For his answers, he would hold up his sign, and shrug his shoulders. Not sure where he got it, but when he first started with the sign, I thought of the "Lorax." At the end of that book, the Lorax leaves the message "Unless." It's not maybe, but they're both kind of ambiguous. We have two baseball players this summer -- Baby Plum and Cheese Puff. Cheese Puff's technically playing t-ball, and Baby Plum is technically playing coach pitch, but they're both baseball to me. 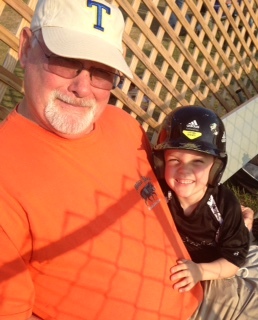 This is our first experience with T-ball. Little Elvis and Baby Plum had no interest at 4. 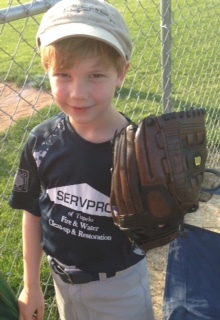 But Cheese Puff did, and T-ball is the cutest thing! It's like herding cats for the coaches I'm sure, but it's funny and cute to watch the little boys chase the ball, even if they are supposed to be running to base. Cheese Puff loves running! Look how cute he is! Here he is posing with Coachpa. I think he was happy about getting around the bases. 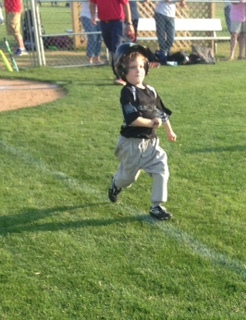 Another great thing about T-ball. Everyone bats until he hits the ball, and everyone runs the bases. Here's Baby Plum smiling before his game. He started out pretty rough, but has gotten so much better! He only got 1 chance at bat this game, and struck out. They were playing a super-tough team. But he has gotten to wear he can hit the ball. He has no interest in fielding the ball, and he throws like me. That's not a good thing to inherit. But Baby Plum is extremely coachable, and willing to work. He's put in the time on batting, and now we just have to put in the time on throwing and catching. Little Elvis is no longer playing for Parks and Rec, but has actually gotten to wear he likes playing. He throws the ball with Bob now, and likes to hit when we're throwing for the other two. He's gotten so much better as well! I think it must be an age and ability thing. Or maybe his interest in football's helped? Bob's play ended last weekend. The boys had a great time at the play, and we managed to take a picture this time. Bob did a great job playing Bert in Mary Poppins. Sweet Cheese Puff had his end of the year performance at school on Friday morning. He was very excited that his parents and grandparents (he calls them that now when referring to them to other people) would come to see him. He did a great job! He sang! His brothers didn't really sing for their pre-school performances, so it was nice to see one sing. The songs were cute, and the older kids sang one that I had completely forgotten from my childhood! I will now try to remember to sing it with Cheese Puff, because it's a fun song -- Skinna Marinky Dinky Dink. I dressed him up pretty nicely, and tucked in his shirt several times before we left home, but it still came untucked. We have a hard time with that. After the performance, we went to a friend's birthday party at Chuck E Cheese for lunch! He was so excited (and bragged about it to his brothers a lot.) Spiderman was there, and my little guy who is normally afraid of characters loved it. He chased him down for a picture! He also found Barney for a picture. He even went up to Chuck E.! This is huge, because Cheese Puff is normally petrified of that mouse. Cheese Puff didn't want a picture, and I had to hold his hand, but he still walked up and fist bumped Chuck E.! I didn't take more pictures, but that Friday evening, I let the boys have a sleepover in Little Elvis' room. Bob blew up the air mattress, because 3 boys can't fit in a twin bed. I did catch them trying to do that, though. I didn't think they were going to make it, but they did! I think they had fun. So, that can be a fun treat for them sometimes this summer, and by treat I mean bribe.